Held inside the SRC’s Inspiration Studio, CSUN students, faculty, staff and alumni can expand their professional fitness portfolio and become certified to teach spinning classes. CSUN alumni who are SRC members receive a special $50 discount when using the code “EDU50” at checkout. Guarantee yourself a great seat for upcoming Valley Performing Arts Center shows by ordering your tickets today. Wear some CSUN gear while you’re on vacation and send us a photo of you. 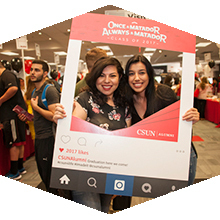 We’ll use some of our favorites on our CSUN Alumni Instagram page (@csunalumni). And just for sending us a photo, we’ll send you a free CSUN luggage tag. Submit photos to alumni@csun.edu, and let us know where you are in the photo. Another reason to join the CSUN Alumni Association is that members receive up to 50 percent off at hotels like Hyatt, Marriott, Hilton, Holiday Inn, Omni, Drury and Westin. Discounts to other hotels are also available.